Customers are fickle, quick to abandon a business for another deal. However, businesses can generally only succeed if they have a stable of indicators in place to ensure customer loyalty. It’s well known throughout most industries that loyal customers are more valuable than a warehouse of programs designed to generate leads. Why is that, and how does one gain customer loyalty? A loyal customer is less likely to abandon ship, so to speak, when a competitor offers the same products or services at a lower cost. Repeat customers are less price sensitive, and less likely to drift away from your business if your products cost more than those offered by competitors. These customers are more likely to buy related and more expensive services and products. The cost to retain these customers is significantly less, with regard to marketing, customer service and so forth, than it costs to acquire new customers. With customer loyalty so important, many businesses are left scratching their heads about the best programs to use to retain customers, or worse, they chase every new marketing fad that comes along. Often times, the best approach to customer loyalty is simple: regular communication that builds a foundation of loyalty. By educating consumers regarding the benefits your products and services offer, and developing brand awareness, whether through a cross-media campaign, low-cost e-mail program or tried-and-true personalized direct mail, customer response increases, securing valuable referrals and loyalty. What do you think? 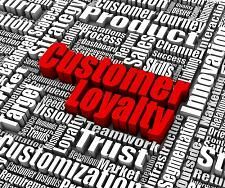 How important is loyalty from a customers’ perspective?